All women without contraindications should be encouraged to participate in aerobic and strength-conditioning exercises as part of a healthy lifestyle during their pregnancy. A reasonable goal of aerobic conditioning in pregnancy should be to maintain a good fitness level throughout pregnancy without trying to reach peak fitness or train for an athletic competition. You should choose activities that will minimize the risk of loss of balance and fetal trauma. Adverse pregnancy issues or neonatal outcomes are not increased for exercising women. Pelvic floor exercises in the immediate post-partum period may reduce the risk of future urinary incontinence. Moderate exercise during lactation does not affect the quantity or composition of breast milk or impact infant growth. Recent investigations focusing on both aerobic and strength-conditioning exercise regimes in pregnancy, have shown no increase in early pregnancy loss, late pregnancy complications, abnormal fetal growth, or adverse neonatal outcomes. Brisk walking, stationary cycling, cross-county skiing, swimming, or aquafit are aerobic exercises that cause less trauma to the joints and ligaments and less bouncing up and down of the centre of gravity than running or jogging. A warm-up and cool-down period should be included in any exercise regimen. Some women may experience symptomatic hypotension from compression of the vena cava by the pregnant uterus and should modify these exercises to avoid lying on your back after approximately 16 weeks of gestation. The ability to perform abdominal strengthening exercises may be impeded by the development of diastasis recti (abdominal separation) and associated abdominal muscle weakness. There is an increase of 10 to 15 beats per minute in resting heart rate in pregnancy. However, at maximal exercise levels there is a blunted heart rate response compared to the non-pregnant state. The use of conventional heart rate target zones should be modified to account for this reduction in maximal heart rate reserve. A modified version of the conventional age-corrected heart rate zone can be found below. Another measure of intensity that can be used is the “talk test” – exercising at a comfortable intensity that allows you to maintain a conversation during exercise. You should stop exercising and seek medical attention if you experience any of the following symptoms: excessive shortness of breath, chest pain, presyncope (light headedness or dizzyness), painful uterine contractions, leakage of amniotic fluid, or vaginal bleeding. This information was taken from the Joint SOGC/CSEP Clinical Practice Guideline Journal. No.129, June 2003. The guidelines were reviewed by the Clinical Practice Obstetrics Committee and approved by the Executive and Council of the Society of Obstetricians and Gynaecologists of Canada, and approved by the Board of Directors of the Canadian Society for Exercise Physiology. 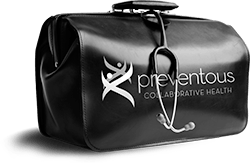 Your Preventous fitness team works collaboratively with your physician, nurses and registered dietitian to help you before, during and after your pregnancy.